The Friday harvest finally included winter squash, and a tiny little harvest it was. These guys were on their own when it came to water, we just didn’t have time and gear to irrigate—given a bit of a rain break, they’ve tended to make out. Unfortunately, the timing of this year’s drought caught the plants later on in the season, late July into August, as they tried to fill out. Bottom line: super low yield and small squash this year, drip irrigation a must…next year. In any case, we did get enough for two rounds of CSA. 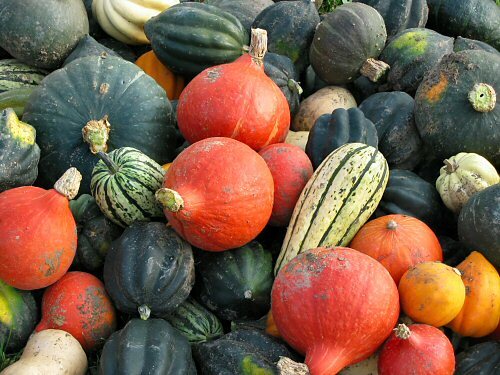 Typically, the acorn squash came through best (Table Ace, Table Gold, Cream of the Crop), the butternut (Early Butternut) are…minuscule. Delicata was a first this year, I’m not sure how large they are usually, but likely bigger than this. And so on. Even the usually prolific and reliable, bright orange Uchiki Kuri, a Hubbard-type (Japanese Kabocha), didn’t do so well. Only the Sweet Mama buttercup came through with some decent dry weather size! So, off to the farmers’ market with an assorted 50 or so, none for sale, all for the CSA shares! Actually the Delicatas look about right, in fact bigger than ours this year with 45 inches of rain to boot. Goooood squash! Greetings from Nashville, Tennessee, USA. Enjoyed your blog and wanted to say hello. Very inspiring. Wonderful work you have done. Steve: I’m still getting around to trying my first Delicata. Expectations are high! Perhaps you can help me. I planted some sweet mama kabocha for the first time this August. At what size should they be harvested? I have grown butternut squash but I have no info on sweet mama. I need small 2# and 4# pumpkins to catapult for World Champion Punkin Cunkin. I stumbled across your website and think it’s very informative.I’m thinking of starting a web design blog. Thanks!